Special guest seminar this Friday! All welcome. We have special guest seminar this Friday by Dr. Maurizio Porfiri. He will be giving a talk on “Modeling finite amplitude vibrations of flexible beams in viscous fluids”. The analysis of mechanical vibrations of flexible slender structures immersed in viscous fluids is of fundamental importance in many technical fields, across a wide range of length and force scales, from atomic force microscopy to naval engineering. One of the main challenges in this class of problems involves the prediction of the forces exerted on the oscillating structure by the fluid. In this talk, I will present a comprehensive modeling framework to interpret and predict the steady-state response of flexible beams oscillating in viscous fluids. We will depart from unsteady Stokes hydrodynamics to consider finite-amplitude structural vibrations, for which vorticity generation and transport modulate the fluid-structure interaction. To illustrate the methodology, I will focus on harmonic bending vibrations of a thin cantilever beam in an unbounded fluid. Theoretical results will be validated against direct three-dimensional fluid dynamics simulations and experiments on centimeter-size beams undergoing low frequency and finite amplitude underwater vibrations. Then, I will briefly touch on torsional vibrations and discuss the role of finite beam thickness, interactions with side walls, polychromatic excitations, and application to biomimetic propulsion and energy harvesting. I will conclude with a series of open questions and possible research directions. Maurizio Porfiri was born in Rome, Italy in 1976. He received M.Sc. and Ph.D. degrees in Engineering Mechanics from Virginia Tech, in 2000 and 2006; a “Laurea” in Electrical Engineering (with honours) and a Ph.D. in Theoretical and Applied Mechanics from the University of Rome “La Sapienza” and the University of Toulon (dual degree program), in 2001 and 2005, respectively. From 2005 to 2006 he held a Post-doctoral position with the Electrical and Computer Engineering Department at Virginia Tech. He has been a member of the Faculty of the Mechanical and Aerospace Engineering Department of New York University Polytechnic School of Engineering since 2006, where he is currently a Professor. He is engaged in conducting and supervising research on dynamical systems theory, multiphysics modeling, and underwater robotics. Maurizio Porfiri is the author of approximately 200 journal publications and the recipient of the National Science Foundation CAREER award (Dynamical Systems program) in 2008. He has been included in the “Brilliant 10” list of Popular Science in 2010 and his research featured in all the major media outlets, including CNN, NPR, Scientific American, and Discovery Channel. Other significant recognitions include invitations to the Frontiers of Engineering Symposium and the Japan-America Frontiers of Engineering Symposium organized by National Academy of Engineering in 2011 and 2014, respectively; the Outstanding Young Alumnus award by the college of Engineering of Virginia Tech in 2012; the ASME Gary Anderson Early Achievement Award in 2013; the ASME DSCD Young Investigator Award in 2013; and the ASME C.D. Mote, Jr. Early Career Award, 2015. 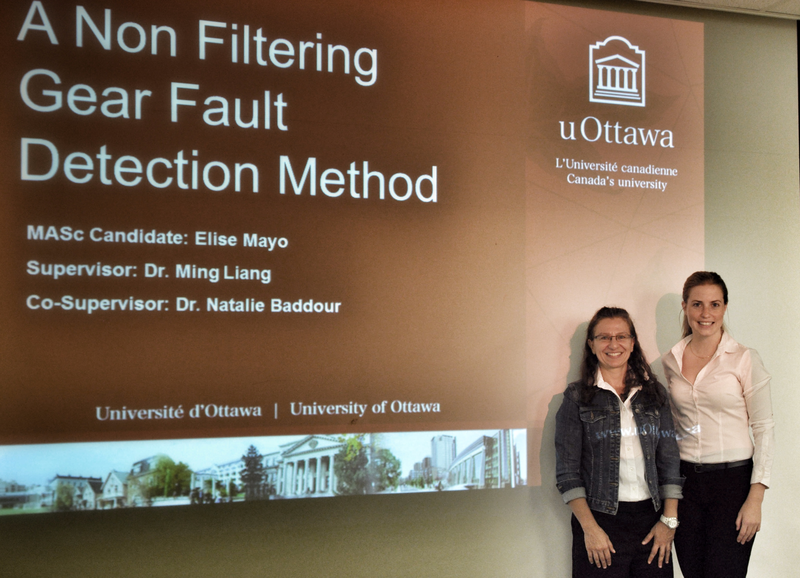 Last Friday, Elise Mayo presented her MASc thesis seminar, titled “A non-filtering gear fault detection method”. Supervisor Ming Liang could not attend but co-supervisor Natalie Baddour was in attendance. Well done, Elise!